The Abacus Screen was developed by Jeff Goodman Studio as a product for architects and designers to merge the beauty of glass into the architecture of a space. The Abacus is a modular, customizable screen that brings the colour and materiality of blown glass to life in any residential or commercial space. The Abacus is available in various metal finishes. It’s designed to have an exposed frame or can be frameless and integrated into the built environment. The screen can modulate light, divide a space, create visual privacy or simply adorn the space with suspended ‘jewels.’ It’s both art and design, and creates a visual signature within any space. Jeff Goodman Studio is excited to launch the Abacus at the Toronto Design Offsite Festival in January 2017. 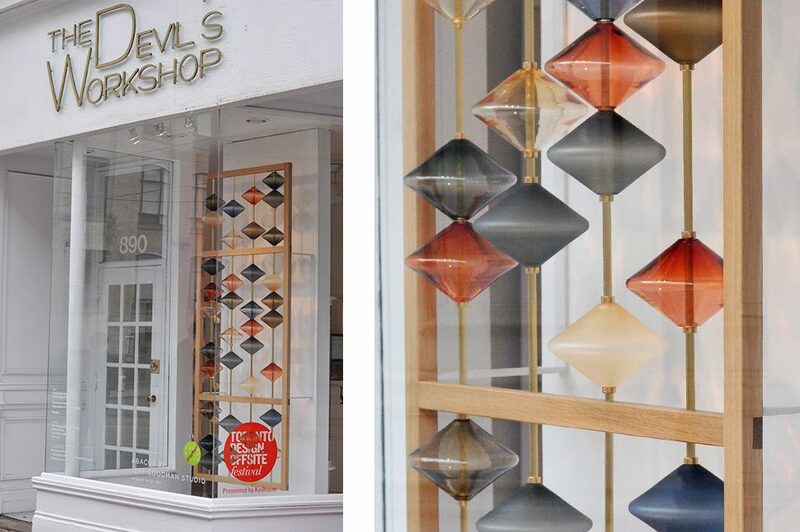 A custom Abacus screen is featured at The Devil’s Workshop Jewelry boutique at 890 Queen Street West. JGS found an exhibition partner with The Devil’s Workshop jewelry boutique because the Abacus acts as architectural jewelry, and both brands push the envelope as to what’s possible in their creative fields.